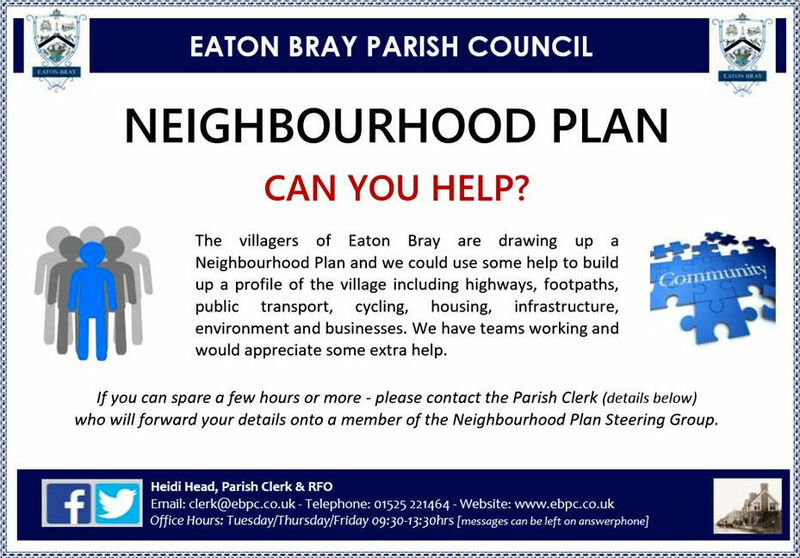 Archives of Eaton Bray News for the Category/Tag Neighbourhood Plan. We are under attack, over the past month or so developers have made Planning Applications (or indicated to the Parish Council their intention) to build houses at various locations in Eaton Bray - namely off Northall Road, on the recently closed Rye Nursery, in Bower Lane opposite Café Masala and of course behind School Lane off Eaton Park. Also, as many of you are aware, the garden roadside wall bounding Old Ley Farm was partly demolished (removal of this 'listed' wall will enable development of the land behind). Demolition was only stopped when residents called the police and CBC's Planning enforcement team - our local MP Andrew Selous is supporting reinstatement of the wall and written to CBC on our behalf. To protect the Green Belt on existing boundaries. New housing should be sustainable and compatible with the heritage and character of the village. New homes should be 2 or 3 bedrooms, be suitable as starter homes or downsizing with sufficient off road parking. Avoid 4 bedroom executive houses. Please support our Neighbourhood Plan, which when made will help protect our village and support appropriate development. Thank you for supporting our work over the past 3 years, the Neighbourhood Plan is nearly complete. Final proof reading and editing is underway and consultant's reports are finished. We will soon be presenting the Plan to the Parish Council for approval before passing on to CBC and ultimately the Inspector. If the green light is given a referendum will be held. We hope that you found this update useful, this and other documents are posted on the Parish web site www.ebpc.uk and follow the link to Neighbourhood Plan. The Consultation finished in June and I would like to thank everybody who attended the two village meetings and those who commented upon our Draft Neighbourhood Plan. The majority of comments supported our Policies and CBC made several helpful suggestions. All responses to the consultation have been recorded and passed to our planning consultant who prepared a summary / analysis and proposals for changes to our Neighbourhood Plan Policies (these are the 14 Policies in our Pre Submission Plan). If approved there will be a referendum. Each parishioner registered to vote on the electoral register will be given the opportunity to vote Yes or No in a referendum to be held later in the year or early in 2019. We hope that you found this update useful, this and other documents are posted on the Parish web site www.ebpc.co.uk - follow the link to Neighbourhood Plan. 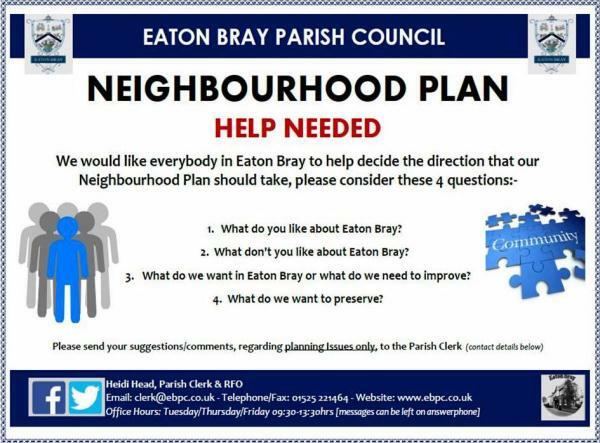 Following consultations last year the Parish Council have completed the Pre-Submission Eaton Bray Neighbourhood Plan. The 6-week statutory consultation period is open until 22 June 2018, and we invite residents to view and comment on the Neighbourhood Plan. Please get involved, this is your chance to have your say. The consultation period runs until Friday 22 June 2018. Comment forms are available on www.np.ebpc.uk or write to The Clerk, Eaton Bray Parish Council, 20 Good Intent, Edlesborough, Dunstable, LU6 2RD. This article was published in February 2018. Please see Latest News for more recent information. Work on our Neighbourhood Plan has gone backwards over the past month. We will explain what has happened. Central Bedfordshire Council (CBC) issued their Draft Local Plan in July last year. We analysed the documents and the main issue from Eaton Bray's stand point was that the Green Belt would remain unaltered around Eaton Bray. We commented on this in our Article in September's Focus. This Draft Local Plan was positive news as the majority of Eaton Bray residents wanted to maintain the Green Belt on its current boundaries. On 11th January 2018 CBC published the next iteration of the Local Plan but unfortunately there was a surprise, CBC had allocated land behind Eaton Park for development! 49 houses in the Green Belt. 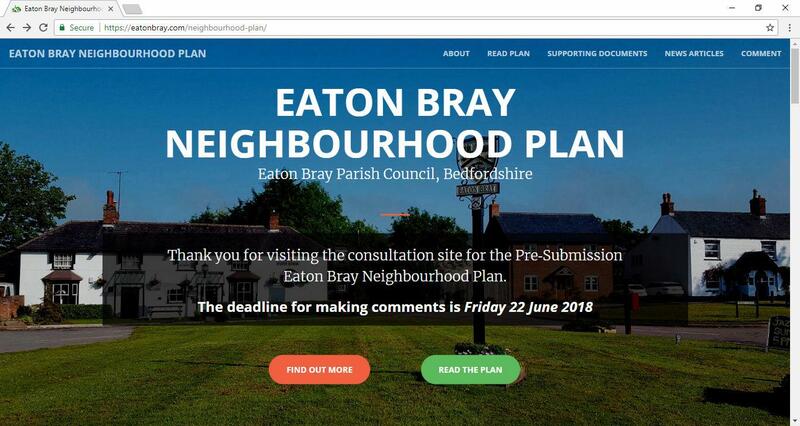 Residents throughout Eaton Bray are dismayed, we wrote to the Head of Planning at CBC and to our Local MP Andrew Selous, but we appear to have little or no influence. Pressing on, we will comment upon the Local Plan, we have made our objections known, and will attend the Planning Committee meeting that can pass or refuse the Planning Application at Eaton Park. The NP Steering Group is supporting the wishes of the residents of Eaton Bray and we should know the result over the next month or so. Meanwhile drafting our NP continues, the majority of the Draft NP is written but we need to add some historical details and make minor improvements. As always we will do our best to keep everybody informed through the Parish Web site and in Focus. Please feel free to attend the next Steering Group meeting which are planned for the last Monday of the month, 19:30hrs at The Coffee Tavern, Eaton Bray. This article was published in August 2017. Please see Latest News for more recent information. Hi from the Parish Council Neighbourhood Plan Steering Group. Work on our Neighbourhood Plan (NP) has continued this summer, we held our first village "drop in" meeting on Monday evening 14th August 2017 and second is planned for Saturday 16th September 2017. We chose an evening and weekend about a month apart to give as many people as possible an opportunity to attend. An advertising flyer was delivered to every home in the village along with a short questionnaire. Response so far has been very good with over 130 attending our first drop in meeting and 206 questionnaires completed so far. The Steering Group would like to say a big thank you for your support. We are now busy preparing for the second drop in meeting and analysing the questionnaires, plenty for our little steering group to do. Central Bedfordshire issued the Draft Local Plan and we responded to their consultation in August. The most notable proposal in the Draft Local Plan is that CBC do not propose to revise the Green Belt in and around Eaton Bray. To conclude we have had a successful summer with good attendance at our meeting and plenty of comments to help form and direct our policies in our NP. The next steps are to analyse this new information and start writing the NP. As always we will do our best to keep everybody informed through the Parish Web site and in Focus. Please feel free to attend the next Steering Group meeting which is planned for the last Monday of the month, 19.30 at the Coffee Tavern, Eaton Bray. Please contact us on [email protected] if you would like to come along. Are you concerned about the possibility of development? Or our school, healthcare, ecology, heritage, transport? Come and meet us at one of the 2 community consultation drop-in sessions at the Coffee Tavern to find out about the Neighbourhood Plan and Have Your Say. This article was published in March 2017. Please see Latest News for more recent information. So far in the Neighbourhood Plan Steering Group we have been looking at the positive featuresof Eaton Bray, our historic buildings, beautiful landscape, wonderful biodiversity and heritage.Government legislation through the Localism Act gives us Neighbourhood Planning and directsus to make provision for new housing. A year ago CBC advised the Steering Group that weshould make provision for 150 new dwellings. However the UK has changed, we are now postBrexit, Trump and perhaps more importantly the Housing White Paper was published. This month we decided to question the direction that we are expected to take with thefollowing message to CBC. The EBNP Steering Group have reached a point where we need some clarification to assist us before we hold a public consultation, and bearing in mind the Housing White Paper has been issued where the Government is clearly supporting / maintaining the Green Belt. Could you please answer the following questions which we would expect to be raised at a public consultation? - Have you completed your Housing Needs Assessment including the area around Eaton Bray? - Have you completed your Green Belt review? - Please advise the very exceptional circumstances for releasing land from the GB in and around Eaton Bray. - What is your expectation for future growth in Eaton Bray and the basis for your calculations? - Are there any sites around Eaton Bray where CBC have an interest and would consider development? If you feel you can offer any support please come along to our meetings. However support doesn't need to be, attending monthly meetings, perhaps you have the time to help with data collection/research. This article was published in November 2016. Please see Latest News for more recent information. Last month we mentioned that we had engaged the services of rCOH, a planning consultancy that has been helping many parishes to produce their Neighbourhood Plans (NP). rCOH are also supporting the Edlesborough NP and will try to achieve a consistent approach between both Plans. New houses in Edlesborough and Eaton Bray have implications on both villages; a good example of this is one shared doctor's surgery. Some of our Steering Group, together with rCOH, met with Central Bedfordshire Council to discuss and understand the current position of the work CBC have done or are currently working through during development of the Local Plan and the role CBC's Community Plan plays in effecting our NP and the analysis and conclusions they have reached so far in providing us with information that will help us develop our NP. Earlier in the year, in a Call For Sites request, CBC asked landowners if they wished to offer up land as potential development sites. The site assessment criteria CBC will use will be issued by the end of November (this article was written before confirmation that the publication date has been met). Once they have carried out the assessments their conclusions will be made available to us. This will also include a review of the Green Belt around the village for possible "roll back", in other words land that may be taken out of Green Belt classification. We understand that the quantity of new homes that could be required by CBC may be in the region of 150.Therefore, including the AVDC requirement for Edlesborough, the potential number for our two villages may be in the region of 300. In the coming months, the steering group will be working on identifying sites that will accommodate CBC's growth requirement and will be asking the village you for your views on the possible location of new homes in Eaton Bray. A Neighbourhood Plan is not all about new houses we have not forgotten the environmental and infrastructure implications resulting from development. We are working on a number of topics that will provide useful information in the development of the NP. For example, in December you may have seen some of the team carrying out a traffic survey in the village at rush hour. This information will help identify which direction traffic leaves and comes into the village at peak times helping us minimise traffic disruption. We will be engaging with the villagers over the coming months to seek views and input. We are currently focussing on having the draft plan ready for the village to review during the first half of 2017. We hope you found this update useful and in coming months we will provide information of the further work of the Steering Group. If you feel you can offer any support, it doesn't need to be attending monthly meetings, perhaps you have the time to help a sub group in data collection/ research, please contact the Parish Clerk at www.ebpc.co.uk - please feel free to attend the next Steering Group meeting. EBPC's Steering Group are writing a Neighbourhood Plan (NP) in order to try and protect our village from unwanted housing development. You only have to look at neighbouring villages to see the effect of uncontrolled expansion. Through the NP we are looking to influence future Planning Approvals by controlling the number of houses, location and size. Other very important considerations are: Sustainable development, traffic, flood risk, biodiversity, heritage assets, landscape; including the 'gap' between Eaton Bray and nearby villages. CBC are developing their Local Plan which is similar to a NP but covering a considerably larger population and area it is a much bigger task. Our Steering Group met with CBC on 2nd November with the aim of working together to best suit the needs of EB. New homes will minimise the effects of growth on the open character of the Green Belt. Broaden the housing stock to meet local needs. Special Character of the Conservation Area and Moore End are sustained. A more accessible and biodiverse network of green infrastructure established around the village. No greater risk of flooding or from inadequate facilities. The Steering Group will be reporting progress through the Focus Magazine so that residents can keep up to date. If you would like your voice to be heard, please feel free to attend the next Steering Group meeting. Meetings are planned for the last Monday of the month at 19:30hrs at the Coffee Tavern, Eaton Bray. Please send your suggestions / comments regarding Planning Issues only to The Clerk. This article was published in January 2016. Please see Latest News for more recent information. This article was published in December 2015. Please see Latest News for more recent information. We have completed 3 months in the development of our Neighbourhood Plan (NP) and are now in the "Evidence gathering and Consultation" phase. What do you like about Eaton Bray? 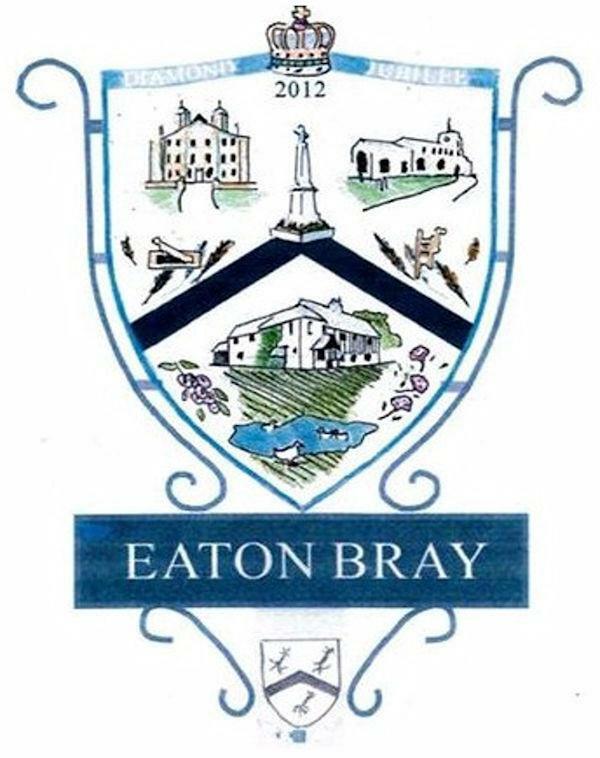 What don't you like about Eaton Bray? 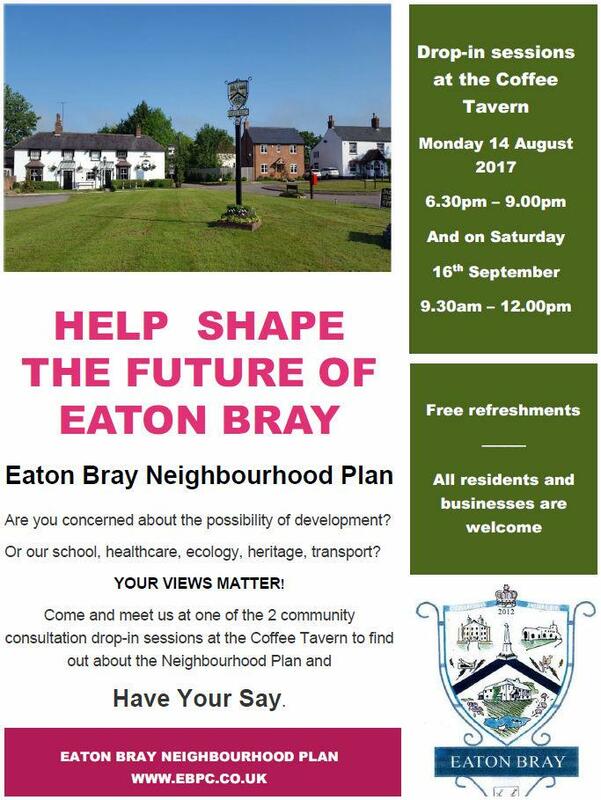 What do we want in Eaton Bray or What do we need to improve? 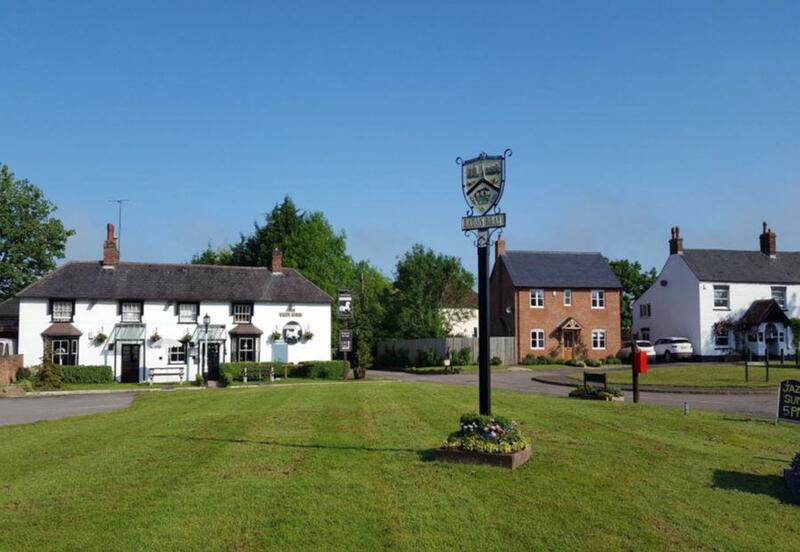 Please send your suggestions / comments regarding Planning Issues only to "The Clerk, Eaton Bray Parish Council, 20 Good Intent, Edlesborough, LU6 2RD. The Steering Group will be reporting progress through the Focus Magazine so that residents can keep up to date. If you would like your voice to be heard, please feel free to attend the next Steering Group meeting. Meetings are generally planned for the last Monday of the month at 19.30 at the Coffee Tavern, Eaton Bray; however due to the Christmas break the NP Steering Group will be held on Monday 11th January 2016.